Photo 1 : Tehran, Iran, (Source: Frank 947, Pixabay). About 52% of the country is covered by mountains and deserts, and about 16% is over 2,000m above sea level. 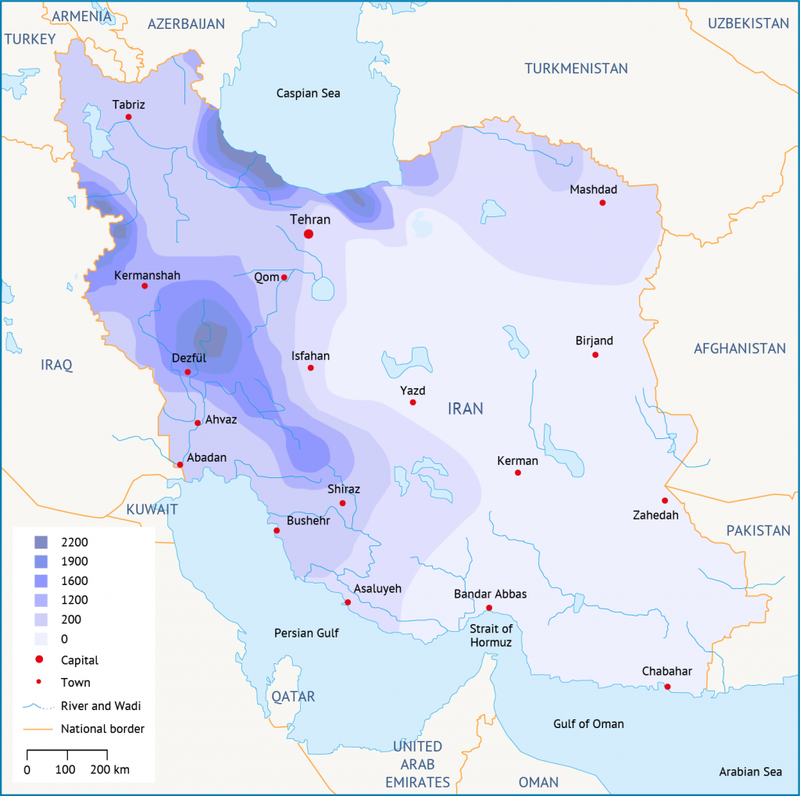 The largest mountain chain is the Zagros, which runs from the north-west southwards to the shores of the Persian Gulf and then eastwards to the most south-eastern province. Another mountain range runs from the north-west to the east along the southern edge of the Caspian Sea. The Interior Plateau, some 50% of the country, is located in between these mountain chains. It includes a large salt lake and desert (Dasht-e Kavir), and areas of loose sand or stones with stretches of better land near the foothills of the surrounding mountains. Iran has a generally hot dry climate characterized by long summers and short, cold winters. The climate is influenced by Iran’s location between the subtropical aridity of the Arabian Desert and the subtropical humidity of the eastern Mediterranean. In the summer, the country’s south-eastern region is affected by the Indian monsoon. January is the coldest month, with temperatures ranging from 5°C to 10°C; August is the hottest month, when temperatures can exceed 30°C. About 70% of the average rainfall in the country falls between November and March; June through August are often rainless. Rainfall varies from season to season and from year to year. Precipitation is sometimes concentrated in localized but violent storms, causing erosion and flooding, especially in the winter months. A small area along the Caspian coast has a very different climate. Here, rainfall is heaviest from late summer to mid-winter, but falls in general throughout the year. Map 1: Precipitation distribution (mm) in Iran, (Source: Ministry of energy, Iran). According to the most recent national census carried out in 2011, the population of Iran is 75.15 million, with an annual growth rate of 1.29%. Some 71.4% of the population lives in urban areas, a percentage that has been steadily increasing for the past 50 years. Over the past 60 years, the population has quadrupled from 13 million in 1956 to an estimated 79 million in 2015. Projections suggest that this number will reach 92 million by 2050. Iran is the second largest economy in the Middle East and North Africa (MENA) region after Saudi Arabia, with an estimated gross domestic product (GDP) in 2014 of $406.3 billion. Iran’s economy is characterized by a large hydrocarbon sector, small-scale agriculture and services sectors, and a noticeable state presence in manufacturing and financial services. Iran ranks second in the world in natural gas reserves and fourth in proven crude oil reserves. Economic activity and government revenues still depend to a large extent on oil revenues and therefore remain volatile. The Iranian state continues to play a key role in the economy, with large public and quasi-public enterprises dominating to some extent the manufacturing and commercial sectors. The financial sector is also dominated by public and private banks. Moreover, the business environment remains restrictive, with the country ranking 130 out of the 189 countries surveyed in the 2015 Doing Business report. The Iranian government has implemented a major reform of its subsidy programme on key staples such as petroleum products, water, electricity and bread, which has resulted in a moderate improvement in the efficiency of expenditures and economic activities. Stimulating private sector growth and job creation is a mounting challenge for the new government, especially considering the number of workers who will enter the labour market in the coming years, including women and youth. On 14 July 2015, the P5+1 (China, France, Germany, Russia, the United Kingdom and United States) and Iran agreed on the Joint Comprehensive Plan of Action (JCPOA), which limits Iran’s nuclear programme while the international community enacts the lifting of sanctions. The medium-term outlook is positive, if the JCPOA is enacted and implemented and the government tackles much-needed reforms. Reforms to the business environment in order to promote competition, rationalize licensing and authorization requirements, reduce the imprint of state-owned enterprises in the economy, and improve the health of the financial and banking sector are needed to accelerate growth and private sector-led job creation. Food and Agriculture Organization of the United Nations, 2009. Synthesis Report: Groundwater Management in Iran. Statistical Centre of Iran, 2011. National Population and Housing Census. United Nations (n.d.). World Population Prospects, Department of Economics and Social Affairs. Available at esa.un.org/unpd/wpp/DataQuery/. World Bank, 2015. Iran Outlook. Available at www.worldbank.org/en/country/iran/overview.